When you have used the trial period, the system will notify you that you have reached the expiry date or the end of your subscription. 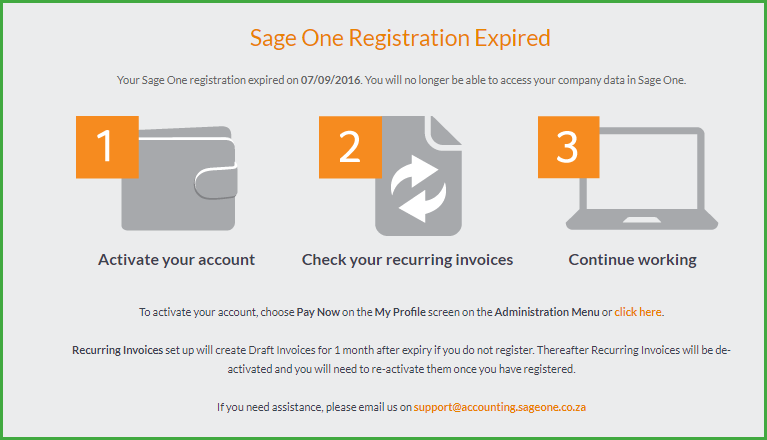 In order to continue working in Accounting you will need to manage your subscription. To view and manage your subscription, click on the My Profile link at the top of the screen. This screen details your current package subscription information. 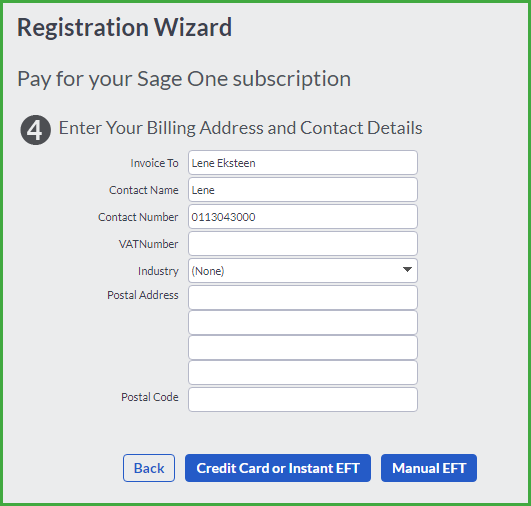 To view your billing information or pay your subscription, click on the Billing Information tab. To view your billing address information and contact details, click on the Billing Address and Contact Details tab. To view or edit your contact details, or to change your password, click on the My Details tab. To view your subscription payment history, click on the Credit Card Payments tab. To view your EFT history, click on the EFT Payments tab. To refer Accounting to a friend, click on the Referrals tab. You can change the number of rows that will display in Transaction and List grids, in the Preferences tab. If you would like to receive marketing and product information, select the Send Me Emails tick box. This screen also gives you the opportunity to invite your Accountant to your company, allowing him/her to process journals and tax transactions. You can manage your users from this screen by clicking on the links. When you have reached your expiry date, the system notifies you that you have reached the free trial version’s expiry date or that your monthly or yearly payment is due, dependent on how you have set up your account. To pay your subscription, click on the My Profile link at the top of the screen. Once you have set up your account on a yearly subscription, you cannot change your account to be on a monthly subscription. You will only be able to change your status when you have to renew your account. If you are ready to make a payment, click on the Pay Now button. If you are paying using a voucher, click on the Pay By Voucher button. Vouchers can only be used for your first payment. Thereafter, you can pay directly by credit card. The Package Details section details your current package information. The base package consists of 1 Company, 2 Users and 1.00 GB of storage space on the Accounting Document Store. The base package is the minimum requirement for Accounting. You can select to add additional Companies or Users to your package. The cost of each additional Company, User and extra storage space on the Accounting Document Store is displayed next to the respective fields. You also have the option to upgrade. Click on the Next button after you have made your selection. 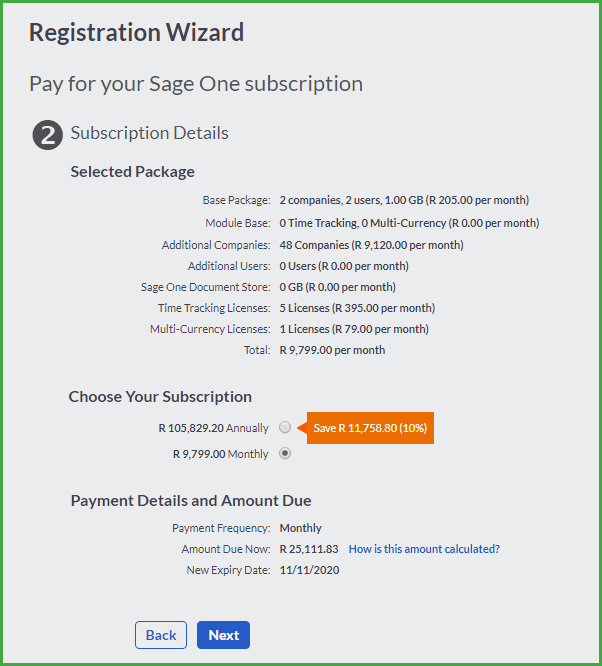 The Subscription Details section, shows the package that you have subscribed for. This screen gives you the option of selecting your subscription on a monthly or annual basis. When you sign up for an annual subscription, you will get a discount which will be detailed in the green arrow next to this field. The Payment Details and Amount Due section details the amount payable. The amount displayed might include an outstanding amount if you have passed your expiry date. Click on the “How is this amount calculated?” link for a detailed breakdown of the amount due. After you have made your selection, click on the Next button to continue. 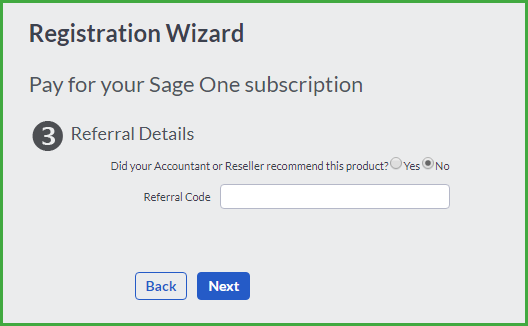 If your Accountant or Reseller recommended this product to you, enter a referral reference number in the Referral Details section. Enter your billing details in the Billing Address and Contact Details section. Ensure that the information entered in this screen is correct because all of the correspondence regarding your package will be sent to the information you provided here. All communication for this website is protected by industry-standard SSL encryption provided by a reputable certificate provider. Online credit card payments are processed by Safeshop. For your safety, no card details are stored by this website. Enter your credit card details and click on the Pay Now button. You can upgrade your account at any time. You will use the Upgrade option if you want to add companies and users to your account. To access the Upgrade option, click on the My Profile link at the top of the screen. Click on the Upgrade My Account button. 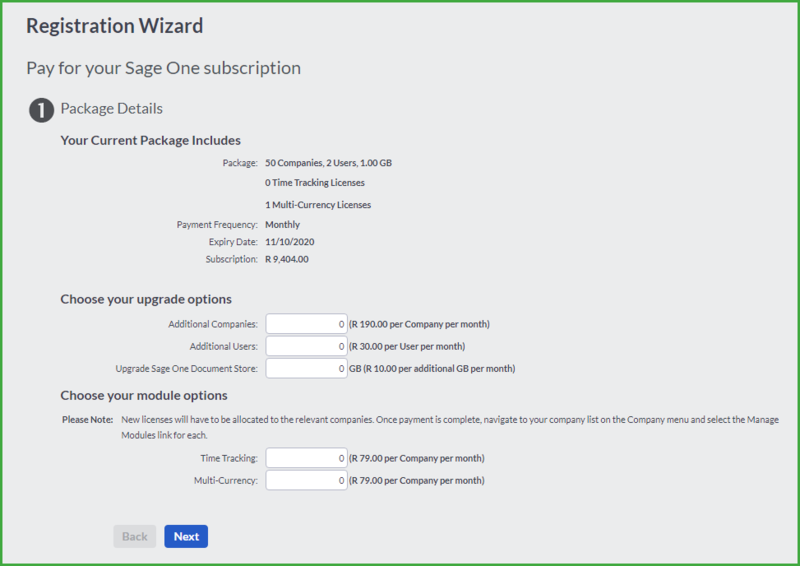 Select whether you want to add additional companies, users and/or storage on the Accounting Document Store to your account, in the Package Details section. 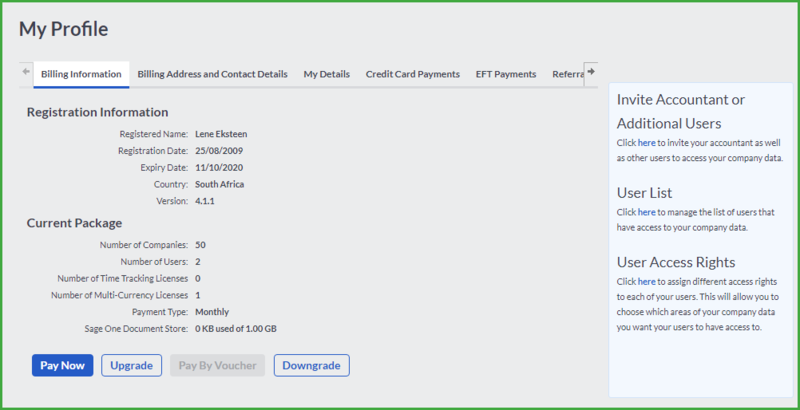 The Subscription Details section summarises your upgrade. Ensure that the information displayed is correct before you continue. The Payment Details and Amount Due section details the amount payable. Click on the “How is this amount calculated?” link for a detailed breakdown of the amount due. Click on the Next button to continue the upgrade process. Enter your referral reference in the Referral Details section, if applicable. Click on the Next button to continue. Verify your billing information in the Billing Address and Contact Details section.